What is the Drew Honduras Project? 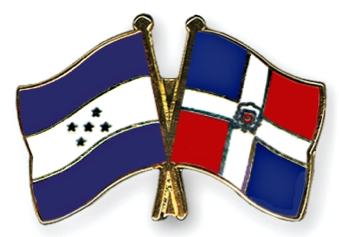 Why is it called the Drew Honduras Project if you also work in the Dominican Republic? In 2013 the US State Department Bureau of Consular Affairs issues a Travel Warning urging caution for those traveling to many parts of Honduras, and as a precaution Drew University decided it would be wise for the Drew Honduras Project not to visit (see more here). We were lucky enough to be connected with a children’s home in Bonao, Dominican Republic, and visited for the first time in May 2013. We have returned every year since then, and plan to return again in May 2018, building strong relationships with the place and the children there; however, we remain connected to Honduras and the many people we have met over the years, both directly via the internet and also through monetary donations to the organizations with whom we built partnerships. We would like to return whenever the situation improves, visiting the DR and Honduras in each trip, but until then we plan to continue to support the country and the people who have welcomed us for so long. We generally refer to the organization as DHP, and it has been suggested that we rename ourselves “Drew Humanitarian Project.” Maybe we will. On the other hand, for many of us Honduras has a deep symbolic meaning and the name reflects our indebtedness to all we have learned from Honduras and her people. The work we do in the Dominican Republic mirrors the work we did in Honduras, reminding us that caring about others can and should occur wherever we are . . . a lesson many of us learned in Honduras. How can I join the DHP? We select 12-16 participants early in the Fall semester so that they can spend the year fundraising and preparing for the trip the following May. Look for us at the Activities Fair the first week of school, watch email for the invitation to apply, or stop back to this page mid-September for more details about the application process! DHP is about more than just a two week trip abroad though. We work to help our neighbors in the US by participating in local volunteer activities as a group or subgroup, sharing donations with local organizations, visiting local schools and churches to share what we have learned in Honduras and the Dominican Republic, educating Madison residents about the situation in Honduras, and organizing events for the Drew community like the annual Honduran Dinner and faculty appreciation refreshments for College Faculty meetings. Group members also raise the funds for the trip, learning fundraising strategies and the bureaucracy around such activities. We welcome students who are not able to join us on the trip as members, and all are welcome to attend meetings, plan and participate in group activities, and learn about Honduras, the Dominican Republic, civic engagement, fundraising, and team-building. How can I help the DHP? If you’d like to help the Drew Honduras Project, there are a number of things we need, but the thing we need the most is money. It costs about $1,000 to send each student on the trip (for airfare, accommodation, food, materials for the work projects, and donations to the children’s homes and groups we work with), and now we also collect money to send to our community partners in Honduras. Each group participant, including the faculty and staff who accompany the students, must raise that money themselves, working alone and with the group in project fundraisers. Every penny we raise is spent getting us to the children’s home where we volunteer, paying for the materials we need to do the work there, and making donations to the organizations with whom we work. We will happily accept (tax deductible) donations of money or items (see the donations page for more details of items the groups we work with need). If you have suggestions about how we might raise money, we’d love to know that too (write to our faculty advisor or leave a comment below.) TO MAKE A SECURE ON-LINE DONATION, PLEASE USE THE “DONATE NOW” BUTTON, select “restricted gift” and then type in “Honduras Project.” All gifts are tax-deductable and are acknowledged by Drew’s Office of Development and Planned Giving. Thank you! I hope this message finds you well. 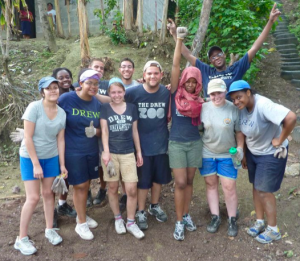 I am a Drew Alumni Class of 1998 and attended the first trip to Honduras! I am thrilled to hear that the Project has continued to grow and expand! It appears that it is truly student driven and more popular than ever. I would love to hear more about your plans for the next trip. Please feel free to email or contact me at 973-985-0651. I am currently a School Counselor in Summit an teach Graduate Social Work courses at Rutgers. I am in the area and would love to participate in supporting your efforts! Fantastic to hear from you Sara! I do hope other alums will contact us as well–and let us know if we missed their name from the “Alumni Hall of Fame” list. We would welcome your donation! * A special thank you to Sandra Jamieson, for so thoughtfully helping to continue the work that a small group of us started 19 years ago… You are remarkable and we all love you! The Drew Honduras Project sounds amazing, very happy to see organizations like this one being promoted and carried out by students. I am glad to hear that the Project has continued to grow, i hope the student are enjoying their time. This is a nice community initiative. Me too! Further proof that a few people can do amazing things if they work together. It’s encouraging to read about young people doing such positive activities. More colleges should allow students to get out of the classrooms and lectures halls for activities such as yours. Great job you make us proud! Thanks. I think if students take the initiative and show that they know what they are doing, colleges would be more than supportive. It is a fact that learning is deeper and more meaningful when it is applied, even if indirectly like this. Hi Garth, thanks for your question. Look for DHP (Drew Honduras Project) activities on campus or contact one of the board members directly via the contact page! Interesting, keep this project to continue to grow, forward education. this is an amazing project ,I look forward to new updates!! This sounds amazing. All the best for future endeavors. It is only when the young take charge of their destiny that they get to learn about how to make the world a better place. Proud to see students make a positive change in the world. OMG so glad to hear about this project. Please updates more! Thank you. Keep it up! their destiny that they get to learn about how to make the world a better place. Proud to see students make a positive change in the world. A special thank you to Sandra Jamieson, for so thoughtfully helping to continue the work that a small group of us started 19 years ago… You are remarkable and we all love you! This is a nice project. I like this very much. Thank you for sharing. im realy-realy touch by this article. Dont know how i can get inside this side. But you all doing a magnificient work for childs. Sorry for my bad grammar, hopely you all get bless from GOD. I’ve been to Honduras and I have seen first hand what is happening there. This program is amazing keep it up! and post some updates if you can. hello, we from indonesia,, your projeck give me more spirit! It sounds good and amazing news that there are good projects like this. I wish you success and supporting you strongly, go ahead. Keep Writing and special thank you to Sandra Jamieson, for so thoughtfully helping to continue the work that a small group of us started 19 years ago. You are remarkable and we all love you!